At least four people are dead and about 50 are missing after a Russian oil drilling rig sank in freezing seas in the Sea of Okhotsk. 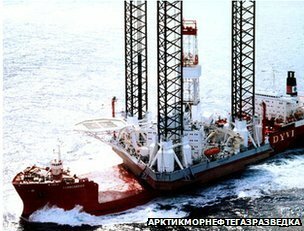 The Kolskaya rig was being towed some 200km (125 miles) off Sakhalin island when it capsized in a fierce storm. 14 people have been rescued alive but it is feared the rig overturned before the rest of the 67 people on board could escape on to life rafts. Rescue efforts have been hampered by poor weather conditions. Helicopters and a plane helped scour the area amid high winds and waves of up to 12 ft (4 m) but the search was halted as night fell. “According to reports from the scene of the rescue operation, the Kolskaya platform has sunk completely,” the regional head of the emergencies ministry, Taimuraz Kasayev, told a news briefing. The accident happened at around 14:00 local time (02:00 GMT) in the Sea of Okhotsk, at temperatures of -17C, as the rig was being towed from the eastern peninsula of Kamchatka to Sakhalin by an icebreaker and a tug. An unnamed regional emergencies ministry spokesman told the AFP news agency that the rig’s portholes had been “damaged by ice and waves, and water began going into the vessel”. The crew had been waiting to be evacuated by helicopter but the platform capsized and sank before they could get to their rescue rafts, he said. Two out of the four life rafts were reportedly found with nobody on board. An investigation has been launched to decide whether any safety regulations were violated transporting the Kolskaya in bad weather.